A County of Greene Land Disturbance Permit is required for any land-disturbing activity that does not qualify as exempt as defined under, “Land-disturbing Activity” in Section 38-72/Definitions of the County of Greene Erosion and Sediment Control Ordinance, and Section 38-122(b)/Stormwater Permit Requirement; Exemptions of the County of Greene Stormwater Management Ordinance. The Land Disturbance Permit authorizes the owner/operator to conduct their land-disturbing activity, and provides both erosion and sediment control coverage, and stormwater management coverage. As a general rule, single family residences; projects disturbing more than 10,000 square feet; projects that are part of a common plan of development; and all re-development projects must obtain a land disturbance permit prior to the commencement of any grading, or clearing that involves topsoil disturbance. For those required to obtain General VPDES Permit Coverage for the Discharge of Stormwater From Construction Activities (VAR10) from the Department of Environmental Quality(DEQ), the county began operation as the local Virginia Stormwater Management Program (VSMP) authority on July 1, 2014 and performs administrative, plan review, inspection and enforcement functions pursuant to the Virginia Stormwater Management regulations. For those applying for General Permit coverage, application and fees are submitted to the county and the county coordinates with DEQ to administer General Permit coverage. A County of Greene Land Disturbance Permit is required for the construction of a single family residence. A permit may only be issued by the county upon approval of: a) an erosion and sediment control plan, or the approval of an Agreement In Lieu of an Erosion and Sediment Control Plan, and b) an approved stormwater management plan, or the approval of an Agreement In Lieu of a Stormwater Management Plan (if required), based on the most current state and county regulations and ordinances. The permit provides the permittee/applicant/owner with both erosion and sediment control coverage, and stormwater management coverage (if required). A stormwater management plan, or Agreement In Lieu of a Stormwater Management Plan is required when the project disturbs 1 acre, or more of topsoil; or when the project is part of a Common Plan of Development. (For purposes of single family residential construction , a common plan of development includes any parcel on which the residence is being built which was created after July 1, 2004.) Single family residences built in the newer subdivisions require a permit. For applicants required to obtain stormwater management coverage under the permit, the county shall provide a Stormwater Mangement Pollution Prevention Plan (SWPPP) to the applicant upon permit issuance. The SWPPP is required by law to be kept on-site, or made available to the County of Greene upon request for inspection. Permittees/owners/applicants/builders should familiarize themselves with the requirement s of this document prior to submitting application to the county for a permit. A County of Greene Land Disturbance Permit is required for all construction projects that do not meet the requirements of being exempt as stated under the phrase, “Land-disturbing Activity” in Section 38- 72 of the County of Greene Erosion and Sediment Control Ordinance, and Section 38-122 of the County of Greene Stormwater Management Ordinance. A permit may only be issued by the county upon approval of an erosion and sediment control plan, and a stormwater management plan, when required, based on the most current state and county regulations/ordinances. The permit provides the permittee/applicant/owner with both erosion and sediment control coverage, and stormwater management coverage when required. New Development projects require a permit when disturbance meets, or exceeds 10,000 square feet, or if they are part of a Common Plan of Development as defined in Section 38-121 of the County of Greene Stormwater Management Ordinance. Re-development projects (known as development on “prior-developed land”) are required to obtain a permit whenever there is a change in imperviousness, or when the disturbance meets, or exceeds 10,000 square feet. 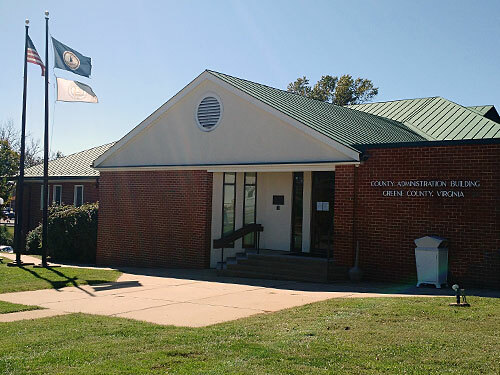 Application for a County of Greene Land Disturbance Permit for the construction of commercial, industrial, residential subdivision, and other projects other than single family residences may only be submitted after the applicant completes a “Pre-application Meeting” with the county. To schedule this meeting please contact the County of Greene Planning Department. Upon completion of the meeting the applicant may submit an application for a land-disturbance permit.